Matthew Henry had the rare ability to express profound spiritual insights with simplicity and eloquence. Over the years, his writings have been read for both their scholarship and devotion, and none more than the classic Concise Commentary on the Whole Bible. 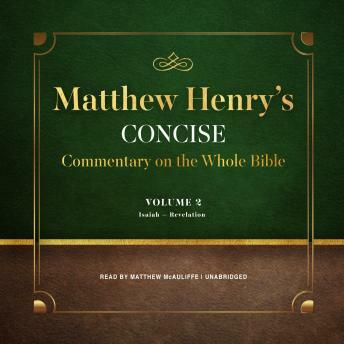 Now you can listen to the very best of Matthew Henry in this new edition of his famous commentary.Henry's profound spiritual insights have touched lives for over three hundred years. A valuable source of reference and sermon material, this classic is a treasure for pastors, students, Bible teachers, and devotional readers alike.